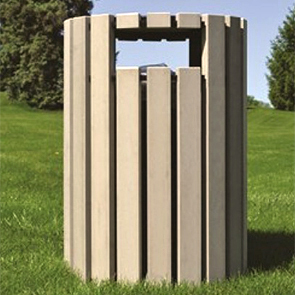 Textbook slat styled trash receptacle, constructed from high grade maintenance free recycled plastic slats. Looks durable because it is durable. The dual side openings allow for the collection of waste from either side of a 2 way traffic pattern area. Lift-off lid for easy waste removal. Rigid poly liner is included.